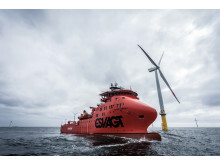 ESVAGT has sold the 'Esvagt Gamma' and the 'Esvagt Promotor' for recycling. The final voyage for the vessels will be to the Fornæs Ship Recycling in Grenå. Two Esvagt vessels in firefighting operation on the North Sea. ​An explosion in the machine room of the tanker, 'Alia', triggered the fire extinguishing system installed on board. The “Esvagt Gamma” is taking part in a project to strengthen environmental awareness and change behaviour.